Recycling helps save resources, energy, and money. It keeps materials out of the landfill, provides jobs, combats global warming, and “closes the loop” through the creation of new products out of recycled materials. See below for ways you can reduce, reuse and rot. Click on items to the left to find specific recycling information. Reducing is the most important thing we can do to curtail the over exploitation of our natural resources. Although we only take up 5% of the planet we consume 30% of its resources, if everyone lived like Americans we would need 5 Planets to survive. Reducing waste is vital to stopping the trend of over consumption. Here are some simple things you can do to reduce waste and conserve resources. Waste not, want not. Buy only what you really need. Think before you buy: Do I really need this? How much will I use it? Could I borrow or rent it instead of buying it? And lend your items to friends. Donate unwanted items to your local thrift stores, friends or family. If it’s broken, fix it! And, whenever possible, pay a bit more for more durable, long lasting products, rather than disposable ones. Reuse glass jars and bottles, yogurt cups and margarine tubs, aluminum foil, fabric, boxes, bags, packing material, wrapping paper, etc. When they can no longer be used or passed on to others remember to recycle all recyclable materials. Bring your own coffee cup and water bottle rather than using disposables. Just say no. “No I don’t need a bag, I brought my own, thank you.” Bring your own reusable bags to the grocery store, drug store, hardware store, clothing stores, etc. For one or two small items, just carry them out. Less Packaging. Buy in bulk whenever possible (bring your own bags) and look for items with less packaging. When packaging is unavoidable, look for reusable, recyclable or recycled content packaging. Buy used instead of new. Buy clothing, furniture, toys, books and other items at consignment and thrift stores, garage sales, antique stores, etc. Use cloth napkins, tablecloths, and dishtowels instead of disposable paper items. Rags can be made from soiled or torn clothing that can’t be donated. Make double-sided photocopies to avoid paper waste. Use 100% recycled paper whenever possible. Make your own notepads. Paper that has been used on only one side can be cut and stapled to make handy note pads for the desk or by the phone. Buy rechargeable batteries that can be used over and over again and then bring them to a free drop off location when you’ve exhausted them. 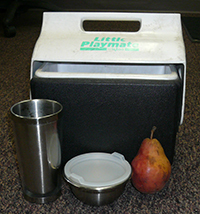 Pack waste-free lunches and picnics. No more plastic wrap! Instead use durable reusable containers or recyclable aluminum foil. No more disposable plates, cups and silverware. Avoid foil drink containers, or Styrofoam containers (none of these items are recyclable). 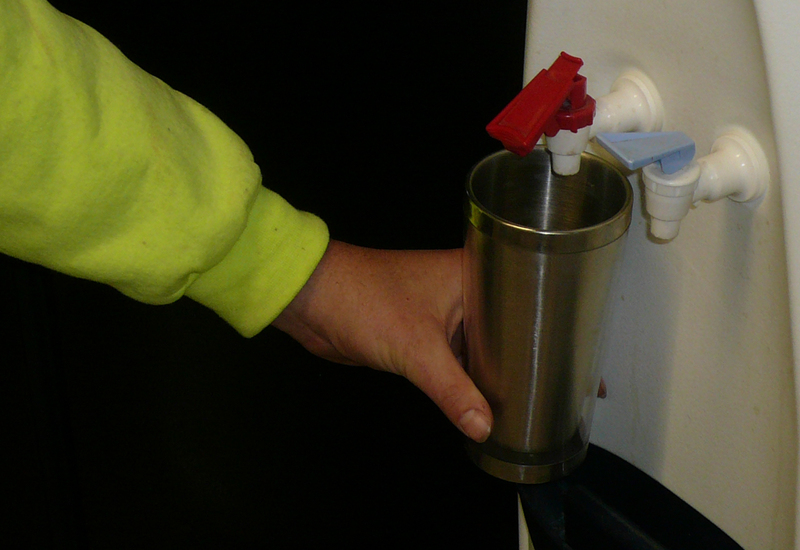 Pack drinks in a Thermos, steel or glass bottles. Compost food scraps in a compost bin or in a worm bin. Write to companies to tell them what you think about their packaging and products. On average 99% of the things we buy we use once and then throw away! By reusing everyday items, we can do a lot to help protect nature and reduce our use of natural resources. Just think about the stuff you use, especially disposable items, and ask yourself if there is something you can use instead. For example, during meals, most of us use napkins. While disposable paper napkins are very convenient to use, they are made from trees that once stood in forests. If we want to protect the forest we can help by using less paper napkins, and using napkins made of cloth instead. Paper cups:The average American uses seven trees a year in paper, wood, and other products made from trees. This amounts to about 2,000,000,000 trees per year! Reusable Cups: take a cup with you to work or to get coffee. Many restaurants will give you a discount for bringing your own cup. Buying items secondhand like bicycles, clothing, books and games is a great way to reuse stuff. Here are other ideas to prolong the life of your things. Much of nature is wasted whenever we use throwaway products such as plastic forks, spoons and disposable chopsticks. For instance, millions of people use disposable wooden chopsticks every day. This is destroying forests around the world at a very quick rate. One way to help these forests is to use reusable chopsticks made from bamboo, metal or hard plastic. We can also protect nature by using other reusable utensils. One simple trick is to carry a metal spoon in your backpack. That way you can always use it when eating out or at school. Think about it…a spoon can act as a fork and can even cut some foods! Try to also use reusable cups and plates whenever you can, as well as cloth towels, cloth napkins and cloth bags. Although water is needed for survival, drinking water out of disposable plastic bottles is a big waste of nature! Here in the United States, most of us have perfectly good and safe drinking water right out of our tap. Rather than buying expensive water in plastic bottles (a gallon of water ends up costing $21.00 if you buy it in small bottles! 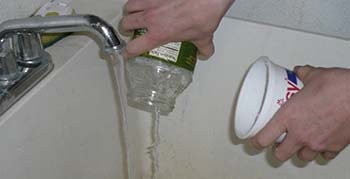 ), put a filter on your sink and fill a metal or glass bottle with water from your tap to take to school or to work. If you do buy water in a plastic bottle, recycle the bottle when empty. Don’t reuse it because the plastic in that bottle isn't’t meant for using more than once, and it can break down over time, putting harmful chemicals into your water. In the old days, when people had less money and less access to stuff, they valued the things they had and tried to keep them around as long as possible. If something broke, they fixed it. If it ripped, they mended it. Nowadays, many people just throw the item away and buy a new one. This includes items like television sets, cell phones and shoes. Try to extend the life of the product you have by fixing it, mending it or doing what you can to use it for as long as possible. Wash out your empty sour cream, butter containers, etc. and use it as tupperware for left over's. Also wash out your old pickle/ jelly jars and use them for left over sauce, homemade pesto or what have you. The point is you don’t need to buy any containers for storage because you already have. Reusing the container even once helps the environment by saving energy and resources. 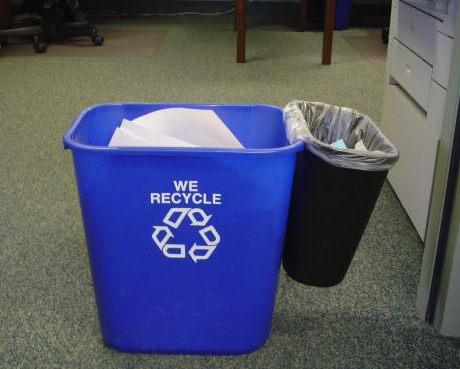 Recycling helps preserve our environment, supports our economy and can save you money. The best way to really make recycling work is to use recycled products and packaging. It’s up to you to close the recycling loop. Use your Purchase Power and buy household products and packages made from recycled materials. drop-off site. The collected materials are then prepared for market and sold to a manufacturing facility. Manufacturing is the second step in the recycling process.The recyclable materials are converted into new products and shipped to stores to be sold as new consumer goods. The third step is where you, the consumer, purchase products made with recycled content. When you “Buy Recycled,” you complete the recycling loop. Always check the post consumer recycled content (% ) of the products you buy. A higher % means more of the product was made from recyclables collected from residential or commercial recycling programs. Here are some items that are manufactured from recycled materials (including your curbside programs). What happens when you buy recycled? Find recycled content paper towels, toilet paper, etc. at the Natural Resource Defense Council's Shopper's Guide to Home Tissue Products. California Integrated Waste Management Board - Search the recycled-content product database to find products, vendors, etc. U.S. Environmental Protection Agency has an Environmentally Preferable Purchasing (EPP) program that encourages and assists Executive agencies in the purchasing of environmentally preferable products and services. The U.S. General Services Administration has a recycled products guide. 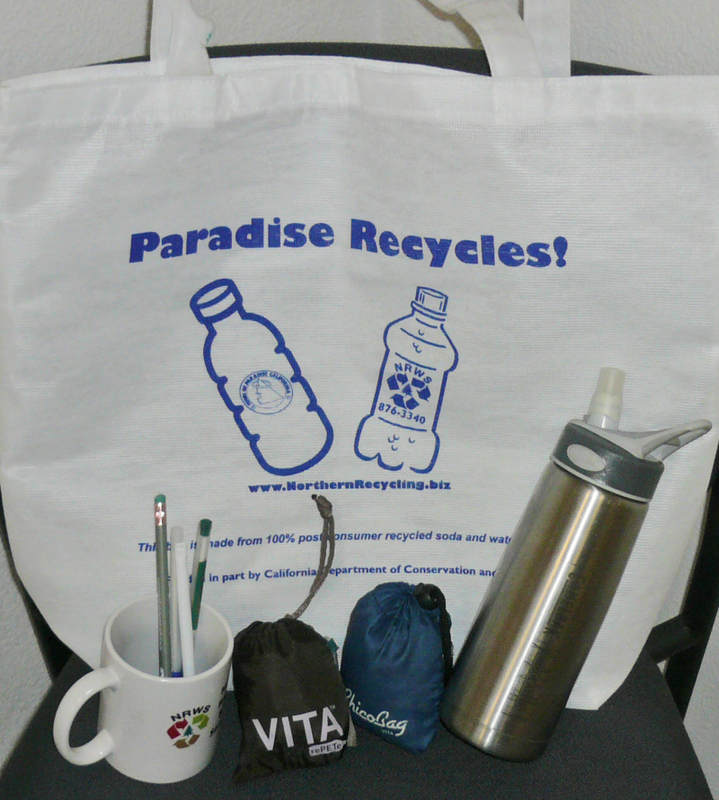 Go to the main website www.gsa.gov and search for "recycled products." Recycled Products Guide provided by the Pennsylvania Department of Environmental Protection. Pennsylvania Resources Council. Their Buyer’s Guide to Recycled Products may help you in your recycled-content product search. RecycleStore - an online catalog of recycled-content products. Composting your left over food scraps, lawn and garden trimmings, is easy to do and helps fight global warming. Composting keep organics out of the landfill where they are in predominately anaerobic conditions (no air) as they degrade without the benefit of adequate oxygen they produce methane, a potent greenhouse gas. You don't have to be an expert to compost; you can even use worms to do all the work for you! 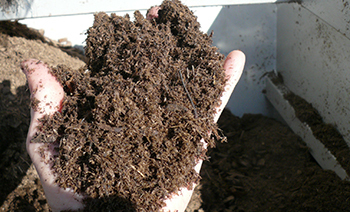 Click here for a complete guide on home composting.